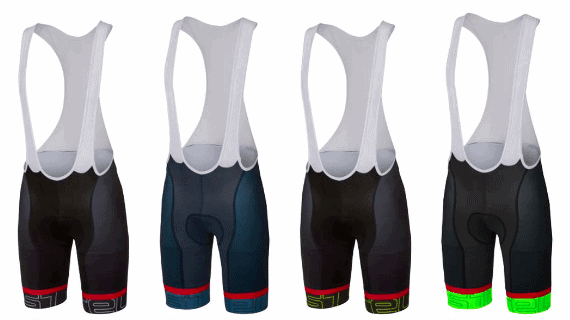 The Castelli Volo Bib Shorts sits in the middle of their racing bib-shorts lineup. Volo means I’m flying in Italian. While it’s not Castelli’s most aero bib shorts, it’s definitely a workhorse. The Castelli Volo Bib Shorts is meant for everyday use. It’s comfortable enough for long training rides or even racing for most cyclists. Even for the professionals, like Castelli sponsored Team Sky, the Castelli Volo Bib Shorts are their go to, everyday pair of bib shorts for training rides. Workhorse Bib Shorts. Made for everyday use from commuting to training rides and even racing. Made from Breathable Fabrics. Suited for the long and hot days in the saddle. 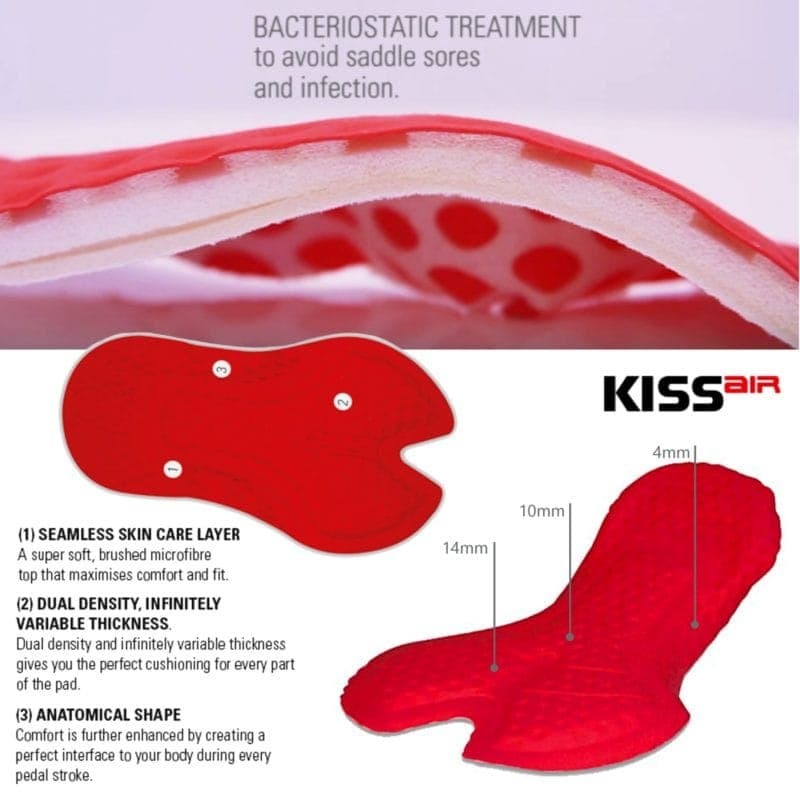 KISS Air Seat Pad. Castelli's mid-range chamois provides plenty of comfort and support at an affordable price. Giro Air Grippers. Top of the line Castelli grippers as used in the very popular Free Aero Race bib shorts. Versatile. Suitable for long training rides and racing. Various Color Options. Choose from 5 different colors to match your jerseys. Sizing. Size can come up smaller for some. The main fabric Castelli used in the Volo is made up of 81% polyester and 19% elastane. Coupled that with Castelli’s proprietary Affinity lycra on the inside leg sections, the Volo bib shorts felt as though it’s a second skin. The material is very comfortable with little chances of chafing. They’re stretchy and more importantly they retain their shape after several rounds of washing. One of the first things you’ll notice about the Volo bib shorts is fabric is quite thin, but not as thin as the Inferno bib shorts. The thinness provides plenty of breathability for the hot days during the summer. But having said that, I’ve also ridden with the Volo bib shorts in temperatures down to between 12 to 15 degrees Celsius and I don’t feel the chill. Castelli reserves their best chamois, the Progetto X2 Air Seat Pad for all their best bib shorts. For the Volo bib shorts, Castelli uses the KISS Air Seat Pad to bring down the costs. While it doesn’t have the premium feel and materials, it ticks all the boxes functionality wise. The pads gone through a bacteriostatic treatment to avoid infection and bacterial growth. The surface has variable thickness with little soft, spongy dimples all over it. The thickness is at the maximum around the ischial zone where the hip bones are and it tapers down at the perineum and towards the outer perimeter. The shoulder straps are white in color, except for the Team Sky version which is black. They’re made from meshed fabrics in order to be breathable, especially at the back panels. Even though they’re not as stretchy and flat as those found in the Free Aero Race bib shorts, they still provide adequate support and not being restrictive when I was on the drops. If there is one feature that the Volo inherits from the Free Aero Race bib shorts, it’s the grippers. The Giro Air grippers in the Castelli Volo Bib Shorts are meshed and semi-transparent throughout. For those who are tan-lines conscious, the grippers are not 100% UV protected and you might want to apply sunscreen beneath them. The grippers are very stretchy and they provide plenty of support with little chances of slippage. More importantly, they don’t curl up like a trumpet after seeing plenty of use. There are mixed opinions about Castelli’s sizing. They’re the typical Italian cycling clothing sizing and for some the size guide is spot on while for some they might need to size up. As for myself, I’d say it’s spot on. I’m 170cm, 68kg and size M fits perfectly. To make things easier for you, here are some anecdotes that I’ve compiled which you can use a rough guide. You’re after a pair of bib shorts for everyday use; whether it’s for commuting, training rides or racing. Being a mid-range offering from Castelli, the Volo bib shorts strikes a perfect balance between affordable price and good performance. 1. How good are the KISS Air Seat Pads? The KISS Air seat pads Castelli’s second in line after the Progetto X2 Air seat pads. But having said that, it doesn’t mean one is better than the other, or vice versa. I’d say it depends on personal preference. I’ve heard good things about both and how some prefer one over the other. You’ve to try them out to know whether they’re suitable. Personally for me, the Progetto X2 Air has a slight advantage as I felt it provides me with more cushioning. 2. Is there a women's specific version of the Castelli Volo bib shorts? There isn’t a women specific version of the Castelli Volo Bib Shorts. However, there are 2 other good alternatives you can consider. There is the mid-range Castelli Velocissima Bib Shorts or if you’re tight on budget, you can consider the Castelli Vista Bib Shorts.